Highly winter-active, Titan 9 is recommended for growers seeking stronger persistence to other winter varieties, demonstrating superior resistance to a breadth of pests and diseases. It is well suited for use in cropping rotations, providing high drymatter production for grazing, silage and hay requirements as well as vigorous recovery from cutting and grazing. Upon germination it was evident that the Titan 9 is strong and vigorous. With an abundance of leaf, a high quality, soft hay that is highly palatable for all livestock. One of the most favorable traits of the Titan 9 is its resilience in a variety of conditions. The ability of Titan 9 to retain leaf throughout the drying process is exceptional. I am impressed and very happy with the production and quality of the hay we have produced with the Titan 9. This Titan 9 paddock was under-sown with Mitiaka oats in autumn 2016. The sowing rates were with 2.5 kg/ha Titan 9 , 2.5 kg/ha Urana sub clover and 40 kg Mitiaka. "I don’t leave animals on all the time, I rotationally graze. The Titan 9 seems to get up and going faster than Auroa, better early vigour. If this paddock had a good rain on it now it will bloom again. It is amazing the growth Titan 9 gave in June and July and we hammered it, then took off the sheep. "The average annual average rainfall is 460 mm. This paddock of Titan 9 was sown September 2016 and has an extremely high stocking rate. It's sown on a paddock near the highway and is a real head turner to the passing traffic. With 90% of our hay going to horses I find the Titan 9 to have fine stems with a lot of leaf. Titan 9 has a good disease resistance and is quick to grown back in our hot weather in central Queensland. Lloyd and David Golinski are impressed with the Titan lucernes. These new cultivars were sown as comparison strips on their property in the Harlin region. They were impressed with their performance and planted larger areas last year with the majority of the planting to Titan 9 lucerne. Over the last 12 months the crop has had its fair share of issues with flooding and heavy periodic rain but has performed well. I have been extremely pleased with the performance of Titan 9. 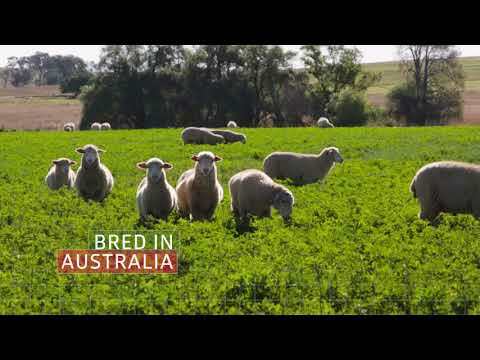 The variety has increased our production of high quality lucerne hay over the last summer. I would strongly suggest that people should seriously consider Titan 9 next time they plant. We were really happy with the germination and purity of Titan 9. Leaf retention through to cutting has been excellent and it has shown very good tolerance to insect pressure. Titan 9 makes beautiful soft leafy hay and is very quick to return after cutting. It has shown higher yields compared to other varieties previously used. The only varieties I'll be planting this year are Titan 7 and Titan 9. Ken Schmidt planted 70 hectares of Titan 9 winter active lucerne on Anzac Day in 2013 and has found it to be one of the better varieties for the farm. “I tested several different varieties here because the growing conditions are different from what I’m used to and Titan 9 and Titan 7 are outperforming the rest,” he said. “Their germination and plant establishment were brilliant, with nice thick plant stands and good yields.” Yields have been consistently above 2 t/ha per cut, with cuts every month through summer. The Titan 7 and 9 are giving higher yields than the previous variety Sequel. Current yields are about 40 odd bales/ac. They both make nice quality, fine stemmed, leafy hay and chaff. Both varieties shone over the Sequel in the wet conditions at sowing. Just after irrigating the blocks to establish the lucerne, it rained heavily. The Sequel didn't survive whereas the Titans established well. After planting planting the same block twice to Sequel and losing both due to the wet conditions, we over sowed the block to Titan 9 and have never looked back.